Botanical paintings are usually done from real life with emphasis on accuracy of size, color and form of the plant species. Botanical illustrations are done more from the scientific point of view, often with cross sections of fruits, flowers or seeds that the plant might have. Some might argue that a photo can do this with more acuracy, but the very fact that we tend to look with more interest at a beautifully done illustration than at a photo of the same plant is proof enough that the artist brings something more to the study than a photo ever can. The challenge really is in bringing the specimen home and in keeping it fresh till you`re done with your work on it. 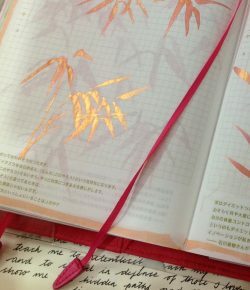 Take some photos to ensure that you don`t get into a panic, if something comes up at home to interrupt your work and you can`t get back to it before it starts to wilt. 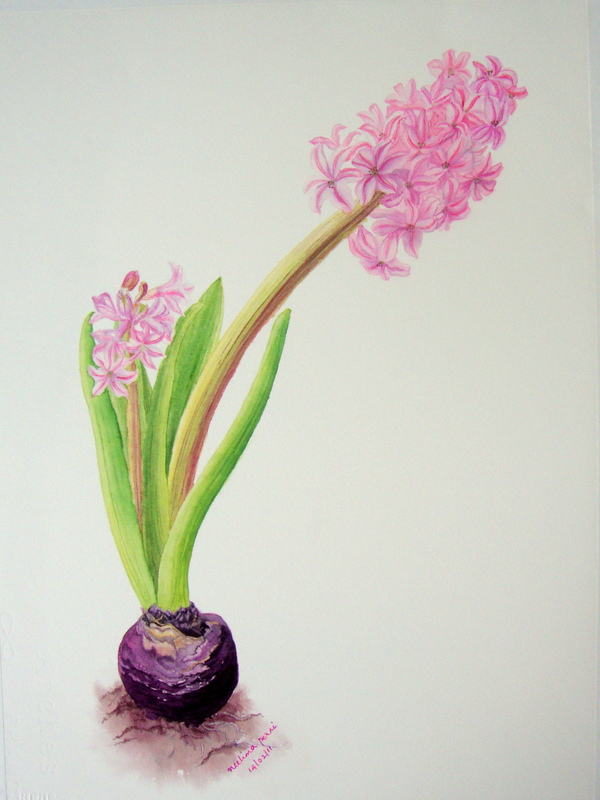 So, I had this sweet smelling hyacinth and I decided to paint it. I waited for it to bloom, then I started to draw it. The next day, what do I see but that my little plant, ofcourse having a will of its own, had completely changed its face. The stalk had turned towards the new direction of light (changing the perspective), the blooms at the bottom had started to droop and the buds at the top opened up and the leaves spread out more. Combine all this with the knowledge of the constantly changing light from my window, I was on the verge of giving up on this. (some artists recommend closing the windows and having the subject and work area lit up with a daylight lamp) But…… I decided to atleast take a shot at it, I would`t be losing anything, so I studied the flower closely, then made up the forms and shadows by imagining a light source from the top left. You would think its easier to paint from a photo since nothing moves in there, but its actually easier to paint from real life because its easier for the brain to grasp the three-dimensionality of the object when its actually there before you. Plus, there`s the bonus of being able to constantly look at and touch and have the heady perfume wafting up your nose all the time you`re working, which is why I`m attracted to this in the first place. But….. I`ll have to take a termin beim mein Arzt (appointment with my doctor) if I continue to do this, to test for any rise in my BP levels! I really don`t like to hurry up while painting, but it looks like there`s no other way if painting from real life. Lesson learnt: paint the flowers first, (the leaves and bulb are not going anywhere!) ; keep drawing to a minimum, just some accurately placed outlines, no details. For the flowers, I`ve used a mix of Schminke ruby red and Daler-Rowney cobalt magenta. DR cobalt magenta is a lovely, very light valued, slightly opaque, pink-violet. I`ve used it here so that I don`t have to use a whole lot of water for the light-valued petals, and the petals have some body to them. For the shadows, I`ve used MG quinacridone violet which is a dull, red-violet. I`ve painted the leaves with the following colours: Daniel Smith Hansa yellow medium and Schminke`s Ruby red, cobalt blue tone and cerulean blue tone. The bulb looks very beautiful, specially when held upto the light. It has pinks, violets and deep violets. The first layer is pink, the next ones violets and then shadows. Leave some highlights for the folds in the skin. Paint a few grey roots.